First things first to avoid potential misunderstandings. The visit of German Chancellor Angela Merkel at this vital time in the rolling Brexit mess is of itself to be welcomed and applauded. Secondly, the EU solidarity Ireland has got since the start of this EU-UK divorce farrago hit us in June 2016 has been nothing short of stellar. Many of the key EU Brexit players have visited, travelled to the Border counties, and taken a keen interest in the practical fall-out from problems this country faces, which they acknowledge to be vastly greater than any other member state. These key EU people are all entitled to be taken at face value as they have expressed real concern and empathy for Ireland. And we must note that they have been steadfast. Ms Merkel, French President Emmanuel Macron, chief EU Brexit negotiator Michel Barnier, European Parliament Brexit leader Guy Verhofstadt and EU Commission President Jean-Claude Juncker are among all those who have repeatedly and generously given strong support. Yes, it has to large degree suited their aim of keeping the EU together in the wake of the exit of the bloc’s second-largest economy. It has also been logical for them to back “remaining Ireland” over the “exiting UK”, and the real test of EU’s durability hinges on treatment of the smaller member states. But, all that said, we must never undervalue the EU heavy-hitters’ determined unity and generosity of spirit in a time of major turmoil. The Brexit political shambles continues to roll in Westminster and nobody can tell where it will land. With seven days to go to the new B-Day crash-out deadline, progress in London is slow and lacks any kind of political shape. Ireland’s tenable Border backstop insurance policy will not apply if the UK MPs fail to avert the default outcome of a no-deal, crash-out Brexit. So, how are we fixed if that happens? Well, from Brussels yesterday came strong signals of concern about Ireland’s lack of preparedness for border checks in the event of the evil outcome. Yet on Tuesday, Mr Macron quite credibly said the EU would never abandon Ireland and the Irish. 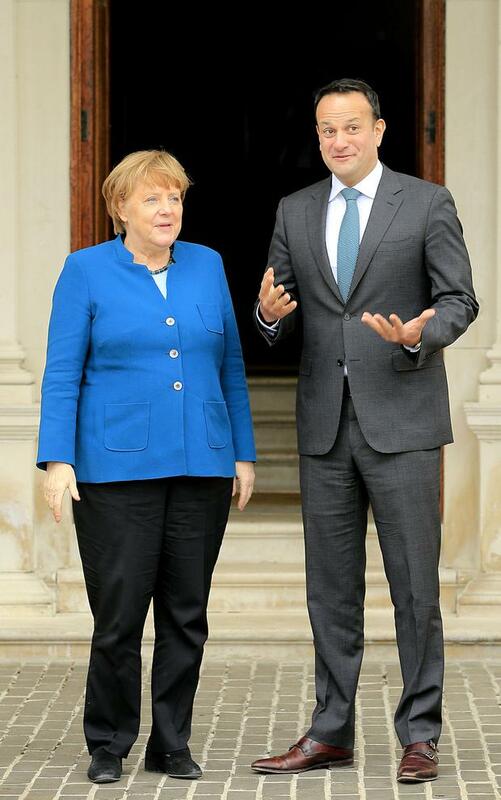 In Dublin yesterday, Ms Merkel, someone who grew up on the wrong side of a very crude partition in her native Germany, impressed by meeting representatives of Irish Border communities. Ms Merkel said the EU would “simply have to” find a way of preventing a Border on this island in the event of a hard Brexit. It was genuinely heartening for many people on this island. The chancellor said she still believed there could be a Brexit deal with the UK, stressing “where there’s a will, there’s a way”. She repeated pledges to work “until the very last hour” to prevent a no-deal scenario. It does not get much better than that. But there’s the detail of protecting a 27-nation border-free market, with strong product standards, and 440 million people.